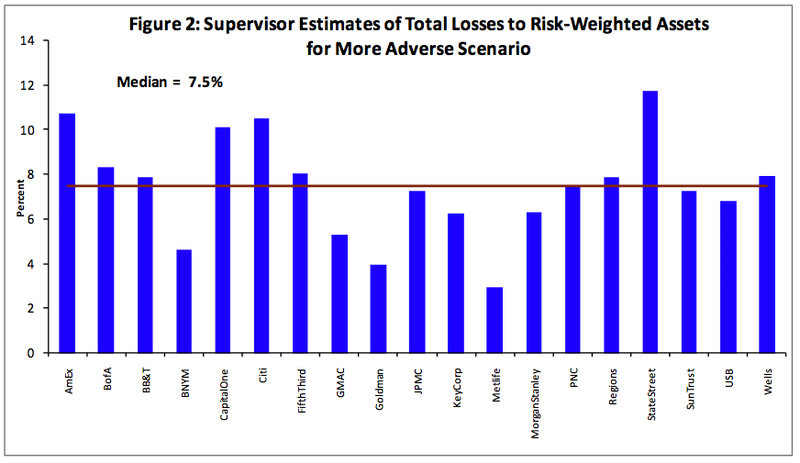 Stress Test: 25-to-1 Leverage as a Healthy Bank Target? The Stress test results are in. Over the next few days, these pages will be dissected and analyzed for its results, correlation to reality, foibles and methodological errors. As we noted back on April 24th, the Stress Tests were not very stressful; That pesepctive was a decidely outlier viewpoint back then. Now, it has become more mainstream, as even a WSJ headline this morning declared: U.S. Banks’ Not-So-Stressful Test. Consider this simple fact: Treasury and the Fed want these banks to have Tier 1 common stock equal to 4% of risk-weighted assets. In other words, 25-to-1 leverage as safe for the future. Hence, it is not a big stretch to conclude that the entire stress test exercise is a near charade, with foregone conclusions of deleveraging banks to still wildly over-extended positions. Recall that before the 2004 SEC Bear Stearns exemption for the 5 biggest investment banks, net cap rules limited leverage to 12-to-1 for investment banks. Is 25-to-1 leverage appropriate for depository banks? Well, maybe before the repeal of Glass Steagal — but with today’s toxic asset laden banks, 25-to-1 seems awfully friendly. “Treasury Secretary Timothy Geithner is betting that U.S. banks can do something their Japanese counterparts were unable to accomplish in that country’s “lost decade” of the 1990s: earn their way out of trouble. 2 Responses to "Stress Test: 25-to-1 Leverage as a Healthy Bank Target?"